Each workshop attendee received a computer tablet containing a virtual “GSA Schedule proposal machine” at Nov. 6th workshop held in Washington, DC. 66 PTAC representatives from across the country gathered in Washington, DC to learn how to counsel their clients in the assembly of a GSA Schedule proposal. 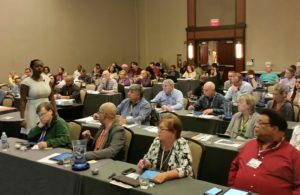 The Contracting Education Academy at Georgia Tech conducted a day-long instructional workshop for 66 members of the Association of Procurement Technical Assistance Centers (APTAC), representing procurement technical assistance centers (PTACs) from across the country. The workshop kicked-off APTAC’s semi-annual national training conference for its membership being held this week. Collectively, the nation’s 97 PTACs represent a nationwide network that assists local businesses compete successfully in the government marketplace. 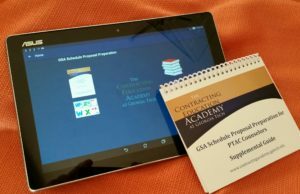 Each workshop participant received proposal templates loaded on a 10-inch Android tablet, plus a printed guidebook covering 25 essential steps in putting together a proposal to GSA. The Academy’s GSA Schedule workshop was presented on 10-inch Android-based tablets. The tablets were pre-loaded with templates and instructional materials based on successful GSA Schedule contracts. Participants learned how to the use the tablet-based tools to walk through the proposal preparation process with their business clients. The Academy’s lead instructor Alexis Kirksey, assisted by Kevin Grimes and Ieasha Jones, led participants through the entire GSA Schedule proposal process, including the administrative requirements, all proposal ingredients and required documentation, and the submittal procedures. Post-award contract administration tips were provided as well. Instructor Alexis Kirksey explains the GSA Schedule proposal preparation process to representatives of procurement technical assistance centers from across the country. As an added bonus, each workshop attendee received a printed flip book summarizing the 25 steps of the GSA Schedule proposal process. The Academy’s GSA workshop, inaugurated one year ago at APTAC’s fall 2015 education event, represents a significant breakthrough in instruction on this subject. The use of tablets, featuring an electronic ‘”GSA app” — represents the first and only training where the GSA Schedule process has been transformed into a computer application. For more information about The Academy’s GSA Schedule Proposal Preparation Workshop, please click here. Doing business with the Homeland Security Department could mean getting the cameras rolling. DHS will be accepting video proposals besides written ones as part of a procurement innovation initiative, said Russell Deyo, undersecretary for management at DHS, in a recent speech. For example, a May 25 request for information concerning a contract vehicle for agile software development called for vendors to submit video presentations. “We’re working hard to be innovative,” Deyo said, speaking at the Homeland Security 2016 Conference of the Armed Forces Communications and Electronics Association (AFCEA) in Washington, D.C. 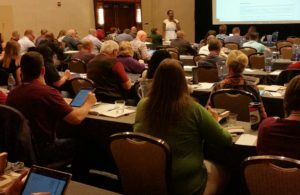 The Contracting Education Academy at Georgia Tech conducted two workshops for 150 contracting professionals in Washington, D.C. this month. Participants worked in teams to solve case studies, explore counseling principles, and develop personal action plans to enhance their knowledge, skills and abilities. On Sunday, November 8, 2015, the Academy presented “Counseling Businesses for Government Contracting Success,” a workshop featuring seven case studies based on real-life scenarios. During the instruction, attendees explored seven counseling principles which matched the case studies. The workshop’s purpose was to help attendees define effective business counseling traits and discover counseling resources. Each person also was given the opportunity to develop a Personal Action Plan to improve counseling skills. Senior instructor Kathy Cames conducted the four-hour session, assisted by the Academy’s program manager Donna Bertrand. The workshop was presented to members of the Association of Procurement Technical Assistance Centers (APTAC) in conjunction with the group’s annual fall training conference. APTAC represents 97 Procurement Technical Assistance Centers (PTACs) – a nationwide network that assists local businesses compete successfully in the government marketplace. On Wednesday and Thursday, November 11 and 12, The Academy also presented a post-conference workshop entitled, “GSA Schedule Proposal Preparation.” This workshop was entirely paperless as it was conducted on 10-inch Windows-based tablets which each participant got to keep. The tablets were pre-loaded with templates and instructional materials based on successful GSA Schedule contracts. The Academy’s GSA Schedule Proposal Preparation workshop enabled participants to engage in the actual proposal assembly process. The workshop began with a half-day of instruction conducted by Microsoft representatives on how to install Windows 365 and how to use the tablets. Following this orientation, instructors Alexis Kirksey, Kevin Grimes and Chuck Schadl walked participants through the entire GSA Schedule proposal process including administrative requirements, the necessary proposal ingredients and documentation, and the submittal procedures. Post-award contract administration tips were provided as well. The GSA workshop represents a significant breakthrough in instruction on this subject. It was the first time The Academy used tablets to conduct instruction — and the first time ever the GSA Schedule proposal process has been transformed into a computer application. The Academy partnered with two firms to develop instructional content and the app. Ms. Kirksey and Mr. Grimes of Atlanta-based CFO Leasing, Inc. collaborated with The Academy’s instructional design team in creating the app’s content, including the exercises, templates, and appendices. Matt Gonzalez of IVSN Group, LLC was selected by The Academy to build the customized app for the tablets. An agency’s evaluation of proposals was not improper even though the Source Selection Authority “cut and paste” portions of a selection document used in a similar procurement – including typographical errors and a reference to a firm that had not submitted a proposal. The GAO’s recent decision highlights an uncomfortable truth of government contracting: while the government can (and often does) demand nearly perfect proposals, the government may be able to get by with sloppy or lazy evaluations. The GAO’s decision in Noble Supply and Logistics, B-410877.4 et al. (July 29, 2015) involved a DLA solicitation for maintenance, repair and operations supplies in the DLA’s south central region, geographical zones 1 and 2. The solicitation called for two contracts to be awarded, one for each geographical region. The Contracting Education Academy’s popular GSA Schedule Proposal Preparation Workshop will be conducted in St. Louis, Missouri on June 11 and 12, 2014. The Georgia Tech workshop helps businesses complete – in as little as two days – a proposal to obtain a GSA Schedule contract. The federal General Services Administration (GSA) awards about $50 billion in blanket contracts known as “Schedules” to hundreds of companies each year. Eighty percent (80%) of Schedule contractors are small businesses who are successful at 36% of those sales. The process to win one of these contracts begins with a proposal, an arduous task that typically takes several months to prepare. Now, thanks to Georgia Tech’s workshop, a GSA proposal can be actually completed at the workshop. If a business is not prepared to submit all the documentation during the workshop, the GSA proposal preparation process easily can be shortened to within 30 days following the workshop. By attending this workshop, business people save time and money with an instructor-guided, do-It-yourself approach as well as avoid mistakes that typically delay or stop GSA Schedule proposals from being considered. Attendees receive expert guidance and valuable instructional documents, including templates and sample narratives based on successful GSA Schedule offers. Fifteen (15) Continuing Professional Education (CPE) credits are granted to each person successfully completing the workshop. The GSA Schedule Proposal Preparation Workshop is conducted by experienced government contracting professionals who have helped many businesses successfully land GSA Schedule contracts. Real world business scenarios are presented during this instructional session, tackling all the difficult and confusing aspects of the proposal process. As an added bonus, The Academy provides workshop attendees with four hours of time with instructional personnel – after the workshop – to answer any remaining questions, review proposal packages, and provide follow-on consulting. The St. Louis GSA Schedule Proposal Preparation Workshop will be held on the Florissant Valley campus of St. Louis Community College, located in north St. Louis County. To register for this one-of-a-kind Workshop, please click here or visit: http://tinyurl.com/kv2by74.